Worlds first successful water powered cotton spinning mill, restored by the Arkwright Society. 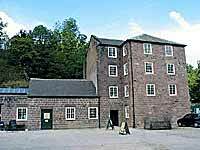 Mill and village tours. Shops and restaurant. Cauldwells Mill, at Rowsley, near Matlock. Chesterfield Market, One of the largest open air markets in England with over 200 stalls. Open mon, fri and Sat. Flea market on Thurs. Over 130 exhibits depicting motor sport history from the turn of the 1900's to the present day. See a collection of over 550 different species and hybrid Rhododendrons as though in a Rhododendron Himalayan valley with Acers, Magnolias and associated plants with streams, waterfalls, ponds, bridges, bog gardens and a wide variety of unusual perennials and shrubs, in a magnificent scenic setting, making a fantastic day out for all to enjoy. Large House amid extensive historic gardens, lake and parkland. Estate museum, riding school, annual events include craft and computer fairs, the county show and a steam rally. Tel 01332 571342 for other facilities at the park. Tel 01332 751972 for Riding School enquiries. 18th century house with collections of local history items, displayed in room settings and galleries.